Critical thinking skills refer to the ability of decision-makers to make logically valid judgments. These skills are essential in all levels of decision making. They help a person to filter out useful and insignificant details to make a sound conclusion. Learning critical thinking skills is essential in promoting creative and independent thinking. Critical Thinking is one of many problem-solving skills. It proves to be more important than IQ in decision making. The intelligence quotient (IQ) is an assessment of one’s mental capacity. It is acquiring, storing, and, recalling information and can be ranked using tests. In comparison, Critical Thinking is the ability to assess situations objectively, make logical connections, factual reasoning, and, eventually, find the appropriate solution with the information available. A person can have lower IQ but strong with critical thinking skills, thus, can have the capability to outrun the ones with higher IQ. The former uses the acquired knowledge to find an appropriate solution to the problems actively instead of just passively collecting information. Socrates (470-399 BC) was recorded to have started the idea of Critical Thinking. He established the importance of questioning assumptions to come up with consistent, factual, and, rational evidence. He believes that people can be seated in high positions with unquestionable authority, but, don’t have the necessary critical thinking skills to assess situations correctly. In the year 2000, Scheffer and Rubenfeld published a list of 7 critical thinking skills for nursing but can be used for different fields and areas as well. These skills are (1) analyzation, (2) standard application, (3) differentiation, (4) information seeking, (5) logical reasoning, (6) prediction, and, (7) knowledge transformation. People who lack this ability will probably have difficulty in solving problems, and, making a sound judgment without jumping to false conclusions. Nonetheless, skills can be acquired, honed, and, improved. Critical thinking is just one of those skills. This course will explain and guide individuals to start thinking critically for personal or vocational reasons. In this course, learners will develop beneficial skills to think critically and improve their lives. It’ll also help them improve their contribution to society. This critical thinking skills workshop is ideal for anyone who would like to gain a strong grasp and improve their critical thinking. The duration of this critical thinking skills workshop is 2 full day. Knowles Training Institute will also be able to contextualised this workshop according to different durations; 2 full days, 1 day, half day, 90 minutes and 60 minutes. Learners develop different approaches to a problem and critical assessment of alternative solutions. Develop a wide view of culture and appreciate differences in opinions. Critical thinking skills course fosters a creative solution to a problem. Development of decision-making skills and rational conclusions. Promote professionalism and fair judgement. Improve teamwork and perception of different points of view. Decrease squabbles over trivial issues. Encourage autonomy and self-directed behaviour. Promote teamwork and cause positive impacts on a culturally diverse environment. Enhancement of presentation and communication skills. Develop an understanding of critical thinking in decision-making processes. Determine the best practices in arriving at a conclusion and resolving disputes that may arise from differing opinions. Development of other skills such as interpersonal and communication skills. Help determine and differentiate inductive and deductive reasoning. Development of creative and independent thinking. Use appropriate tools and techniques to investigate the problem. Break down problems to smaller manageable matters. Recognize the main issues that need thorough investigation. Clarify outstanding trivial issues with colleagues. Provide relevant evidence and facts for reference. Distinguish links among facts and issues. Analyze findings before jumping to quick inappropriate conclusions. Develop solutions to address the issues recognized. Justify decisions made to address the issues. Explain the resulting resolutions from the investigation. Encouraging a well-reasoned and sound argument. Understanding the fallacies caused by misuse of logic. Establishment of a working environment that uses non-linear thinking. Identifying gaps during problem-solving and decision-making procedures. Establishing business strategies that avoid assumptions and expand perceptions about situations. Integration of logic into decision-making procedures. What do people know and don’t know about reasoned judgment? Key components of critical thinking skills. Dos and Don’ts in a critical thinking culture. Definition and understanding of human rationality. Analysis and understanding of challenging assumptions. Importance of active listening and Communication skills. The significance of Using Socratic discussion. Identification of major challenges to critical thinking. Solutions to effective thinking challenges. Determining factors for critical thinking. What are the steps to be done to identify problems? What tools and techniques can be used to breakdown problems? How can you determine the primary issues of the problem? Who is involved in the problem? Where can you get relevant evidence and facts? Different quantitative and qualitative approaches to solve problems. What is the overall impact of the problem? How does it affect the people involved? Group discussion to find the solution. How do you examine the results of the solution? Panel presentation of the case study. There are 3 pricing options available for this Critical Thinking Skills training course. Course participants not in Singapore may choose to sign up for our online Critical Thinking Skills training course. 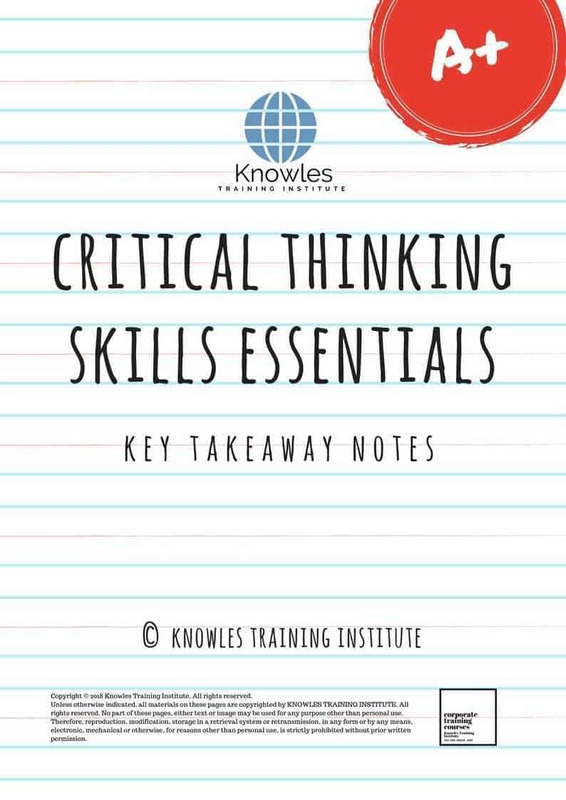 Request for this Critical Thinking Skills course brochure. Fill up the short information below and we will send it to you right away! Register For This Critical Thinking Skills Course Now! Share This Critical Thinking Skills Training Course! Critical Thinking Skills course, workshop, training, class, seminar, talk, program, programme, activity, lecture. Critical Thinking Skills courses, workshops, classes, seminars, talks, programs, programmes, activities, lectures in Singapore. Critical Thinking Skills improvement tips, Critical Thinking Skills techniques, improve Critical Thinking Skills, improve Critical Thinking Skills games, Critical Thinking Skills improvement exercises, improve Critical Thinking Skills power, how to have good Critical Thinking Skills, how to have good Critical Thinking Skills in studying, how to build up your Critical Thinking Skills, how to improve Critical Thinking Skills how to improve Critical Thinking Skills course in Singapore. Enhance, boost, build up, enlarge, heighten Critical Thinking Skills course in Singapore. Increase, intensify, raise, reinforce, strengthen Critical Thinking Skills. Upgrade, amplify, boom, elevate, exaggerate, magnify, grow, gain Critical Thinking Skills. Develop Critical Thinking Skills, multiple, power up, beef up, bolster, establish, extend Critical Thinking Skills. Invigorate, restore, step up, toughen, empower, fortify, regenerate Critical Thinking Skills. Rejuvenate, renew, escalate, expand, maximize Critical Thinking Skills. Powerful, mighty, impressive, competent, great, excellent, exceptional Critical Thinking Skills in Singapore. Superb Critical Thinking Skills. Super, superior, strong, solid, active Critical Thinking Skills training courses and workshops in Singapore. Critical Thinking Skills enhancement, booster, building up, enlargement, heightening, increment, strengthening, amplification. Critical Thinking Skills magnification, growth, development, power, empowerment, regeneration. Critical Thinking Skills rejuvenation, development, escalation, expansion. Critical Thinking Skills maximization, power training courses & workshops in Singapore.